The story of Orion began as fiction. A Georgia-based writer, Gail Brewer-Giorgio, concocted a tale about a charismatic rock 'n' roll singer, Orion Eckley Darnell, who came to be called 'King' because of his enormous popularity across the world. However, this shy, sensitive superstar came to view his fame as a trap and a curse. Because he couldn't do anything as simple as buy groceries or fill a tank with gas without drawing a mob, he was forced to live in seclusion. His body bloated, and he sank into a deep depression. But, this being fiction, the man devised a fantastical route to escape his living hell. He created a wax figure of his own overweight image. Then he grew a beard, lost weight until his waist was trim again, and faked his own death in the mansion that had become his prison. After attending his own funeral, he drove off into the sunset in a beat-up station wagon with luggage strapped to the roof. As he drove, the first tribute song to the life and death of Orion blasted from the radio. 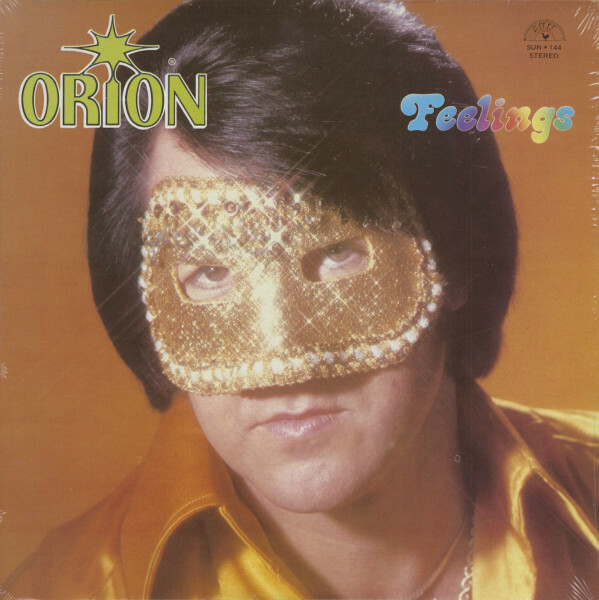 Brewer-Giorgio wrote 'Orion: The Living Superstar of Song' prior to Elvis Presley's death on Aug. 16, 1977. But she had failed to get it published until after his death -- and after she gained a fan in Nashville-based record producer and music mogul Shelby Singleton, who had purchased the Sun Records catalog and name in 1969. Singleton, it turned out, had been trying to figure out a way to utilize the talents of an Alabama-born singer, Jimmy Ellis. Born on February 26, 1945 in Orrville, Alabama, Ellis began his recording career in 1964 on the Dradco label. By the time he crossed paths with Singleton, he'd spent nearly a decade pursuing a career as a romantic balladeer and hip-shaking rocker. But he'd found little success. Then, in 1972, Singleton received a two-song single that included the song, I Used Her To Remind Me Of You. When Singleton first heard the song, he thought, "Man, either that is Elvis Presley singing, or it's someone who sounds just like him." The singer was Jimmy Ellis. He had recorded the songs in Fort Walton, Florida, with producer Finley Duncan. After the release of the single, which gained some success from rural radio play in the South, Ellis got involved with another record man, Bobby Smith of Macon, Georgia. The two collaborated on a couple of singles and an album, 'Ellis Sings Elvis', that traded off of Ellis' ability to sound remarkably similar to the most famous rocker in the world. "They were all Elvis hits," Singleton says. "The album sounded technically as good as anything Elvis ever did. The songs sounded very, very close to Elvis to me." The album was created before Presley's death. But as Jimmy Ellis and Bobby Smith were preparing for its release, the world's most famous rocker was found dead in his Graceland mansion. Immediately, of course, interest was heightened in the deceased legend. Smith rushed the album out; at the same time, Smith contacted Singleton to ask if Sun might want to get involved. "I told him, 'Bobby, I just don't think an Elvis impersonator doing Elvis songs would do anything," Singleton recalls. "It won't be original. People won't want to buy an imitator doing Elvis songs, but possibly songs not related to Elvis." Smith brought Ellis to visit Singleton, who took the singer into the studio. They cut the classic song Release Me, as well as several other songs not generally associated with Elvis. Listen to those recordings now, and it's obvious that Ellis managed to resemble Presley's vocal tone and mannerisms more than other soundalikes and imitators. "It sure sounded like Elvis to me," the producer says. So Singleton, who owns a legendary ability to scheme up unique record promotions, felt the wheels start to turn. There must be some way to make money of a Southern farm boy with jet-black hair and long sideburns who sounded almost exactly like the best-selling musical performer the world had ever seen. "I told them, 'Well, maybe we can do something here,'" Singleton says. "But we have to come up with a gimmick in order to make someone pay attention to it. You're not going to get any attention just because you sound like Elvis. There already were hundreds of Elvis impersonators out there. But Jimmy was different. He wasn't an imitator, he was a soundalike. I thought we could do something with him if we came up with an angle that was unique.” The first gimmick Singleton conspired was to continue to stoke the idea that Ellis might actually be Elvis. But instead of simply having him sing covers of Presley songs, he began pairing Ellis with Presley's famous colleagues from the Sun Records era. To start, he took Ellis in the studio and put his voice onto some old Jerry Lee Lewis masters that had been recorded at Sun Records. He purposely left Ellis' name off the cover, simply billing the album as 'Jerry Lee & Friends', in hopes that people would think that the unnamed singer was Elvis Presley. It worked, at least to some degree. "Immediately after I put it out, it got on the radio and of course everyone thought it was Elvis, that it was something I found in the can," Singleton says. "We kind of had a reputation for doing weird things anyway." Singleton went on to create another album that cashed in on the mystery of whether the unnamed singer was Presley or a soundalike. He pasted Ellis's voice onto more tracks and that paired him with Lewis, Carl Perkins and Charlie Rich. The latter album was billed as 'Trio +'. In each case, Ellis's name never appeared on any of the credits. But the trick of "Who is that mystery vocalist?" could only go on so long. So Singleton came up with an even wilder gimmick. 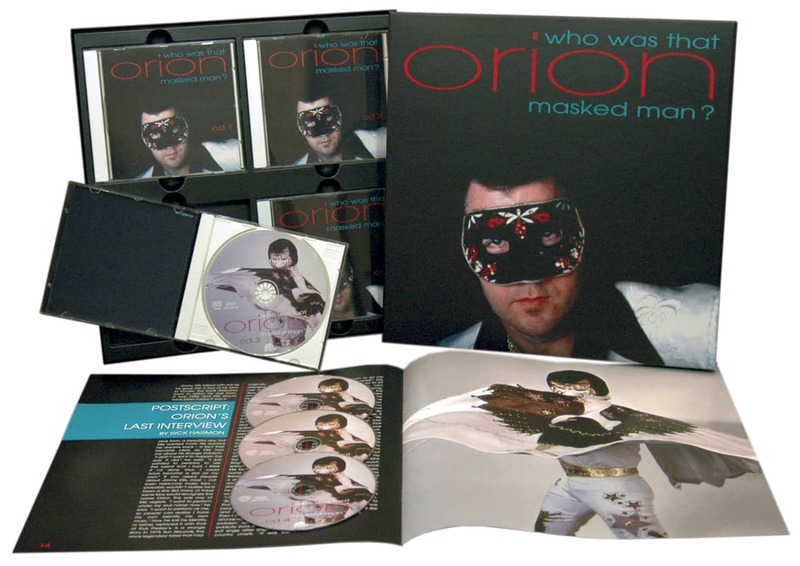 The Sun owner heard about this unpublished book, 'Orion: The Living Superstar of Song'. "The book had been written as a parallel of Elvis' life," Singleton says. "Only it had a twist at the end. It was written before Elvis died, and the writer had come up with this very smart twist that showed a way that Elvis could have faked his own death and still be alive." Singleton decided to contact the author, Gail Brewer-Giorgio, who lived in Georgia. "I thought that if I could make a deal with this lady, we can take Jimmy and we can make him over to be Orion," Singleton says. Of course, there were a few sticky points. For instance, Ellis may have had thick black hair and long sideburns, but his was not the face of Elvis. Leave it to Singleton to come up with a plan, however. "I thought, 'If he would just wear a mask, we can make him a star,'" Singleton says. Ellis, however, didn't exactly embrace the idea of spending the rest of his career peering through the ornately made, rhinestone-studded masks that his mentor had in mind. "He didn't really want to do it," Singleton says, still incredulous at the insubordination. "I had an artist here at the time that I had to transform in some way to make him famous, and he was resisting. But, looking back, I think he didn't like it because he figured none of his friends would know that it was really him." 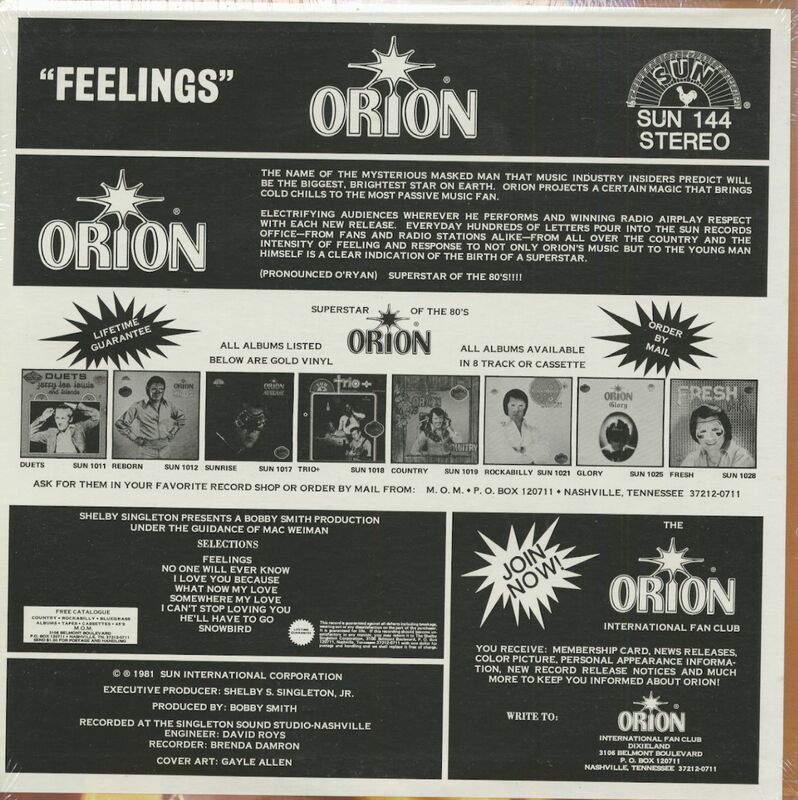 Customer evaluation for "Feelings (LP)"